The general line of thinking behind these programs is one of the happier legacies of the George W Bush administration. His homelessness czar Philip Mangano was a major proponent of a “housing first” approach to homelessness. And by and large it’s worked. 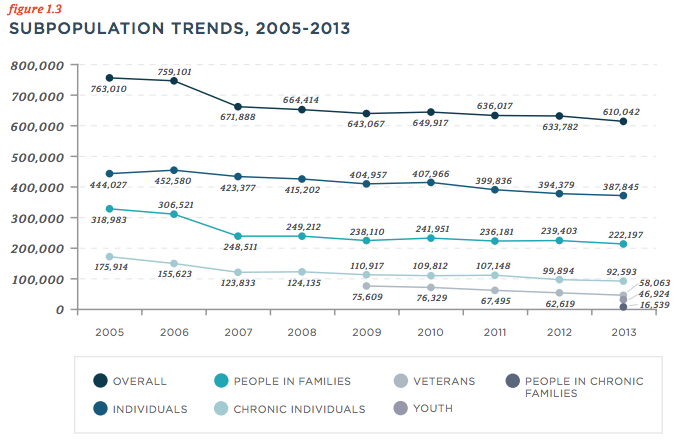 Between 2005 and 2012, the rate of homelessness in America declined 17 percent. Figures released this month from the National Alliance to End Homeless showed another 3.7 percent decline. That’s a remarkable amount of progress to make during a period when the overall economic situation has been generally dire. But the statistical success of anti-homelessness efforts even in the face of a bad economy underscores the point of the Florida study. When it comes to the chronically homeless, you don’t need to fix everything to improve their lives. You don’t even really need new public money. What you need to do is target those resources at the core of the problem — a lack of housing — and deliver the housing, rather than spending twice as much on sporadic legal and medical interventions. And the striking thing is that despite the success of housing first initiatives, there are still lots of jurisdictions that haven’t yet switched to this approach. If Central Florida and other lagging regions get on board, we could take a big bite out of the remaining homelessness problem and free up lots of resources for other public services. Here are 11 other Myths About Homelessness in America.